In the many CLIF Bar reviews that I have done, I can honestly say that outside of a few flavors, I've never been too impressed with their products and have never understood why they get such a devout following. It's not that they taste awful, but the majority of them are just soft and chewy mixes of nothingness. 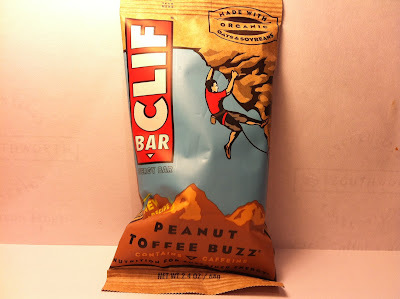 That said, I'm still going to try them out and during one of my regular visits to The Dollar Tree recently, this CLIF Peanut Toffee Buzz bar jumped out at me and I grabbed it and lugged it home to try out. 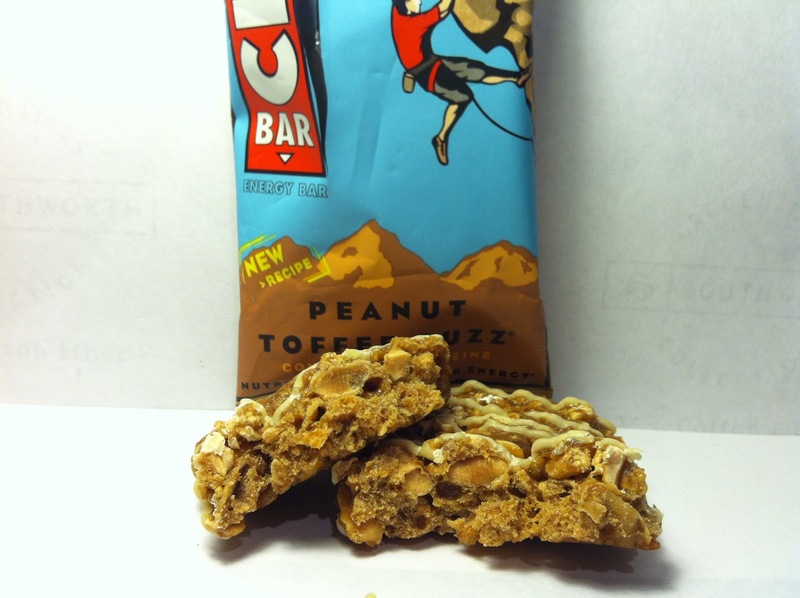 As with all CLIF bars, this one is 2.4 ounces, 240 calories and contains ten grams of protein. One thing that is different about this one is that it carries on its packaging a warning label of "Contains Caffeine" and that is something I've never seen on a CLIF product before, so my interest was definitely piqued by that. In case you were wondering, the caffeine comes from Green Tea Extract, which is listed as one of the ingredients on the wrapper. When I took this out of the packaging, I've got to say that I was slightly surprised by how this one looked. It had a vanilla "icing" swirl on top of the bar to make it a bit more showy, which while that is on some CLIF bars, it is not really a typical thing seen on the majority of the bars I've reviewed. Outside of that, this pretty much looked like any CLIF bar would look like. It had its typical CLIF Pro mix of oats and soybeans and it was extremely sticky from the peanut butter that was being used to bind everything together. Within the Pro mix were bits of peanuts and toffee pieces. Being that I often times find myself being unable to keep my hand out of the cookie jar, so to speak, when toffee is around, I was very excited about this. Biting into the bar, I could definitely tell that I was not going to have my standard CLIF bar experience on this bar, meaning I wasn't going to be bored by lack of flavor. Frankly, this bar was entirely delicious. The peanut butter was typical peanut butter, but it was hearty and thick, which is just the way I like my peanut butter. The peanut bits themselves added a nice little crunch to the typical soft and chewy CLIF Pro mix and anytime you can get some sort of crunch to break up the monotony of chewiness, it is greatly appreciated. As for the toffee pieces, well, they were everything I could have hoped for and more. They were crunchy, sweet and had that kind of teeth rattling sweetness you get when you eat a piece of toffee. It's the kind of teeth rattling that sort of makes your molars hurt and while that doesn't sound like it is appealing, it really is because it's sweetness that wins you over. When you take this flavor and mix it with the hearty peanut butter that kind of extinguishes it a bit, you get a brilliant flavor combination that works very well together. The vanilla icing which wraps up the bar is pretty much for decoration, because I personally could not taste it as it most likely got lost in the flavor of the peanut butter and toffee. Buy It or Fly By It? When you've had so many of these bars, both CLIF products and products from other manufacturers, it's sometimes hard to rank your favorite bars in any particular order. That said, I will say that this is a bar that I would put near the top of any sort of attempted list that I tried to create listing my favorite bars that I've tried out for this blog and it definitely gets a BUY IT rating. If you can stand the molar rattling sweetness that comes with the toffee, you are really going to like this bar because it is freaking delicious. As for the caffeine aspect of the bar, I can't really comment on that with any sort of confidence because I can't tell you if I felt any more or less awake after eating this. Seriously, this is one of the BEST energy/power bars out there. I love this flavor. I wish we could find it easier...you always find the boring flavors...but this one I usually have to go to Whole Foods to pick up. Dude; you NEED to make your 'list'/'ranking' like you did for cereals. Do one just for Clif flavors...or bars in general! This Cliff bar has got to be at the top though. I eat Clif bars somewhat frequently; how is it that I've never noticed this flavor before? My guess is that I probably passed it by, assuming it to be another "generic/boring peanut butter flavored bar". Apparently this is not the case... must keep my eyes open for this flavor. And caffeine makes everything better.